A tattered Australian flag, salvaged from the tip, has been named the winner of the 2013 Parliament of New South Wales Aboriginal Art Prize, taking out the coveted $40,000 prize ahead of 32 other works exhibited in this year's finalist group. Karla Dickens’ January 26, Day of Mourning was announced as the 2013 Prize winner at an awards ceremony held at Parliament House overnight. 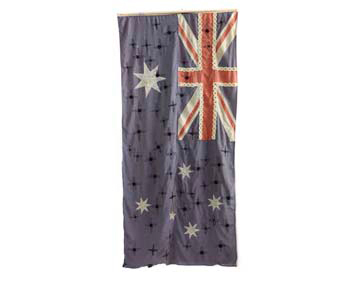 The work transforms an old Australian flag, which has been embroidered and embellished by the artist. Currently the richest art incentive on offer for Aboriginal artists born or living in New South Wales, the Parliament of New South Wales Aboriginal Prize is made possible through a partnership between the Parliament, Campbelltown Arts, the NSW Government (through Arts NSW), the College of Fine Arts, University of NSW and Coal & Allied. Also linked to the main Prize are some additional artist residencies and scholarships through COFA, with a value of over $120,000. Also speaking at the ceremony was the Hon. Pru Goward, Minister for Community Services and Women representing the Hon George Souris, Minister for the Arts; Cr Clinton Mead, Mayor of Campbelltown City Council; Ms Cate Sims, Aboriginal Relations Specialist for Coal & Allied and Mr Graham Forsyth, Associate Dean, COFA Creative Learning Unit. In addition to the main Art Prize, the awards ceremony also encompassed the 2013 COFA Indigenous Professional Development Award, which includes an Artist Residency at COFA; the opportunity to work with COFA staff in a medium of choice; a solo exhibition at EPS Gallery, COFA and up to $500 worth of art materials, travel expenses and per diems. The winner this year was Warwick Keen, for his work Colour barcode (scan me I may be Aboriginal). The Parliament of New South Wales Aboriginal Art Prize is currently on display at the NSW Parliament on Sydney's Macquarie Street, and will be until 31st October. Entry to the exhibit is FREE, with doors open 9am to 5pm Monday to Friday. Following the exhibit, the works will commence a tour of selected regional galleries in New South Wales.